This pretty headscarf uses simple chains and shells arranged in a specific manner to achieve this lacy cross-over look; and is finished with slip stitched chains used to tie off. 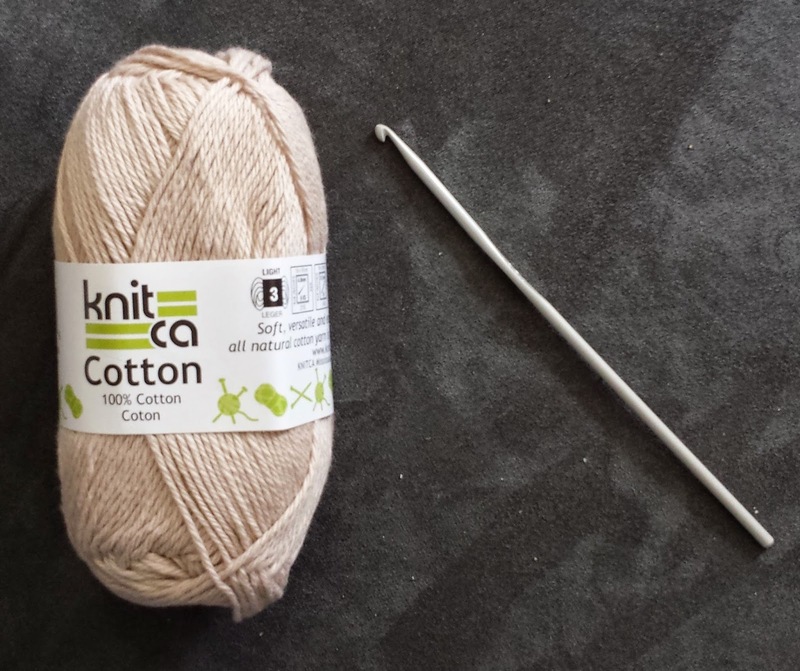 I chose a light weight bamboo yarn because of it`s elegant silky touch and drape, along with the fact that bamboo is an anti-microbial and moisture wicking fiber; (not to mention highly sustainable) an obvious choice for a summer garment! Shell= (2dc-ch2-2dc) in same space. Shell in next shell= Shell in ch2 space of next shell. Row 1: Dc in 4th ch from hook, (ch2-2dc) in same st, *ch 9, skip next 13 chs, shell in next ch** 7 times across. Row 2: Turn, sl st over to ch2 space; ch3, (dc-ch2-2dc) in same space, (ch 9, shell in next shell) 7 times. Row 3: Turn, sl st over to ch2 space; ch3, (dc-ch2-2dc) in same sp, (ch4, work a sl st over ch9 from last row, ch4, shell in next shell) 7 times. Rows 4, 5, and 6: Turn, sl st over to ch2 sp; ch3, (dc-ch2-2dc) in same space, (ch 9, shell in next shell) 7 times. Row 7: Turn, sl st over to ch2 space; ch3, (dc-ch2-2dc) in same sp, (ch4, sl st over ch9 from last row, ch4, shell in next shell) 7 times. Rows 8 and 9: Turn, sl st over to ch2 sp; ch3, (dc-ch2-2dc) in same sp, (ch 9, shell in next shell) 7 times. Do not fasten off. Row 3: Ch1, turn; (sc2tog) 7 times. ... ch121, turn; sl st in 2nd ch from hook, sl st in next 119 chs; sl st in last st of Row 3. Fasten off. 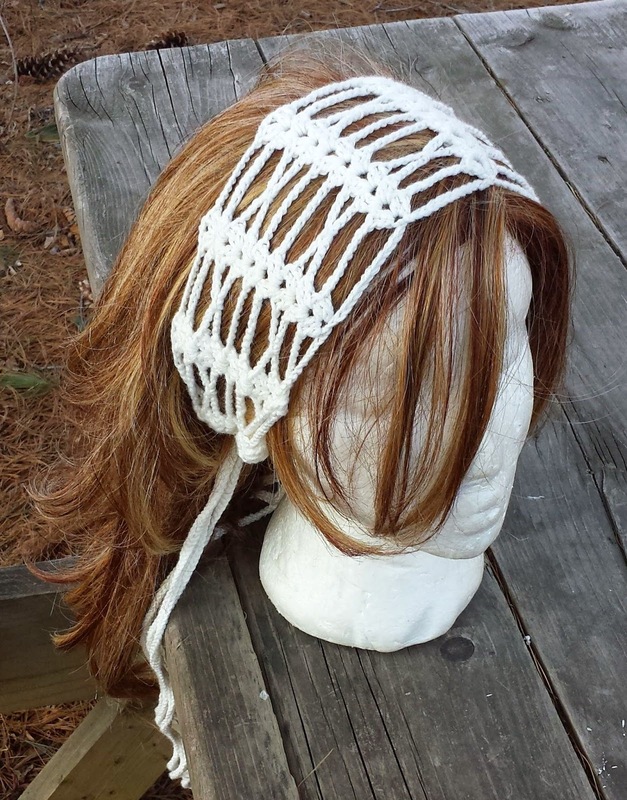 -Attach yarn with a sl st to top dc space; Repeat directions for Side Strap and Tie. 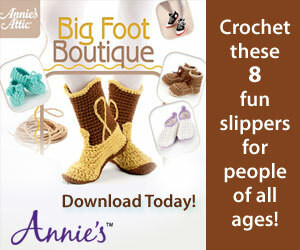 A nice, light weight crochet pattern, these slippers are great for those cool spring mornings. These are not only cute, but quick to make! The sunflower is such a bold and amazing flower. I love this shade of yellow and everything else about this dress! It is a lot of work, but the end result is worth it. 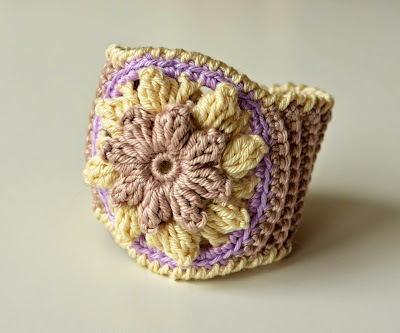 This beauty of a bracelet immediately caught my eye! The large flower and the color scheme gives this piece a nice natural essence, but with a unique twist! 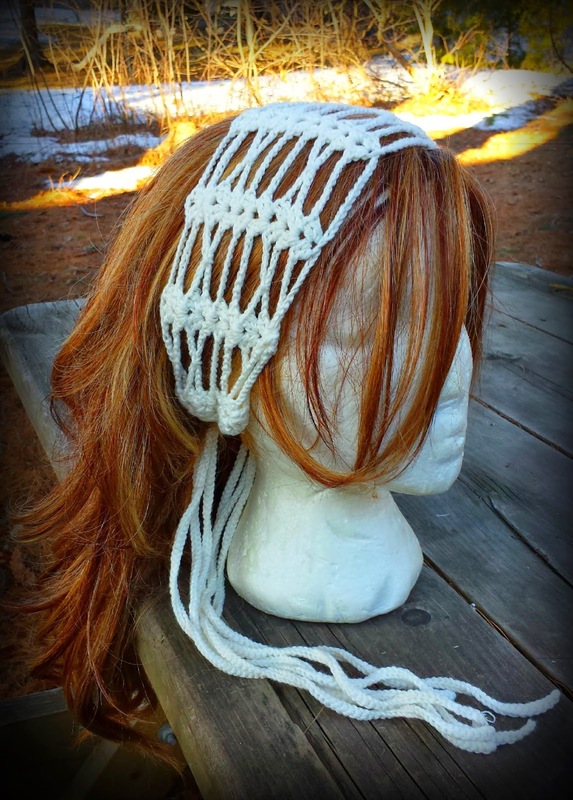 The designer also gives a full tutorial which includes photos. I can't wait to try this. 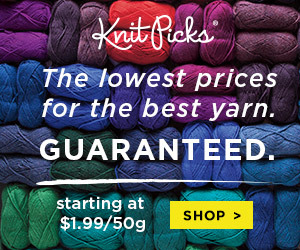 Yarn in three colors. (Yarn weight: Sport; Texture: 5 ply (12 wpi). One button of the appropriate size. 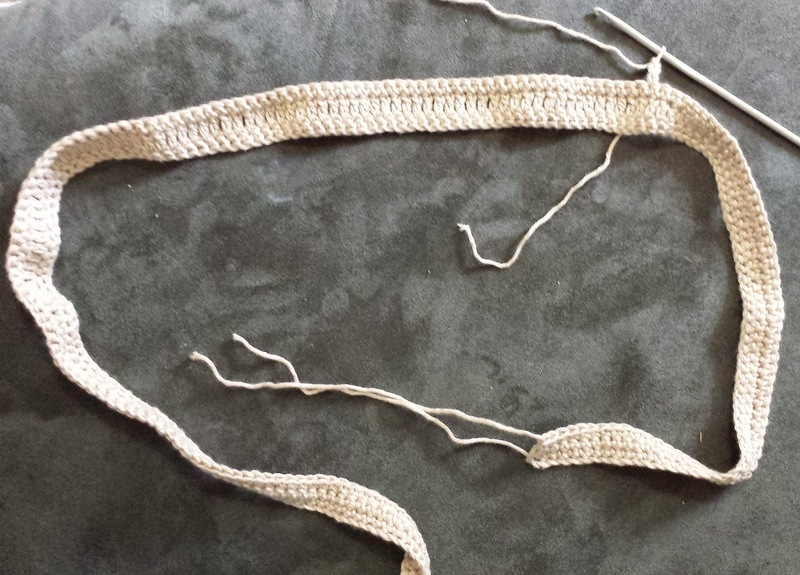 I've been playing around with different stitches and came up with a new barefoot sandal pattern! 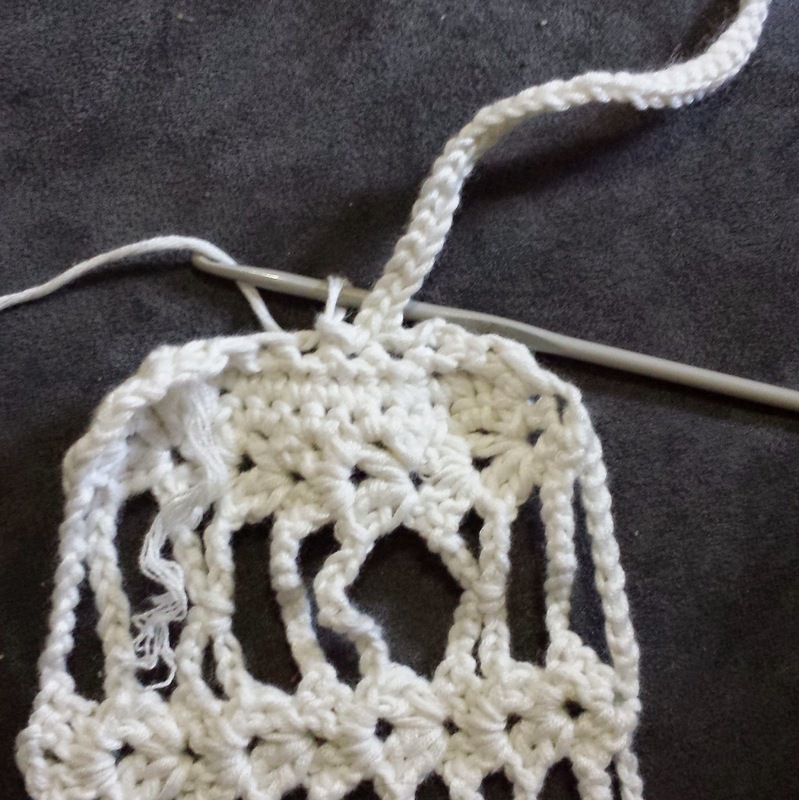 The "V" Stitch is a very easy stitch, which gives a great defined look to crochet pieces. 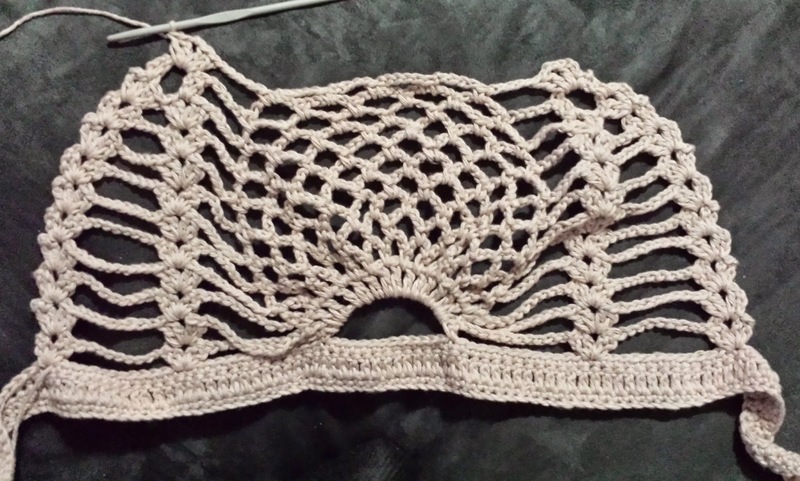 This pattern works from the toe up. Row 2: Turn, sl st in 1st ch1 space; ch4, dc in same space, [ch1, v-st in next ch1 space] twice. Row 3: Turn, sl st in 1st ch1 space; ch4, dc in same space, [ch2, v-st in next v-st] twice. Row 4: Turn, sl st in 1st ch1 space; ch4, dc in same space, [ch3, v-st in next v-st] twice. Row 5: Turn, sl st in 1st ch1 space; ch4, dc in same space, [ch4, v-st in next v-st] twice. Row 6: Turn, sl st in 1st ch1 space; ch4, dc in same space, [ch5, v-st in next v-st] twice. Row 7: Turn, sl st in 1st ch1 space; ch4, dc in same space, [ch6, v-st in next v-st] twice. Row 8: Turn, sl st in 1st ch1 space; ch4, dc in same space, [ch7, v-st in next v-st] twice. Row 9: Turn, sl st in 1st ch1 space; ch4, dc in same space, [ch8, v-st in next v-st] twice. Row 10: Turn, sl st in 1st ch1 space; ch4, dc in same space, [ch9, v-st in next v-st] twice. Row 11: Turn, sl st in 1st ch1 space; ch4, dc in same space, [ch10, v-st in next v-st] twice. Row 12: Turn, sl st in 1st ch1 space; ch4, dc in same space, [ch11, v-st in next v-st] twice. Ah, these are adorable! Are you a dog admirer, or you just cat crazy? 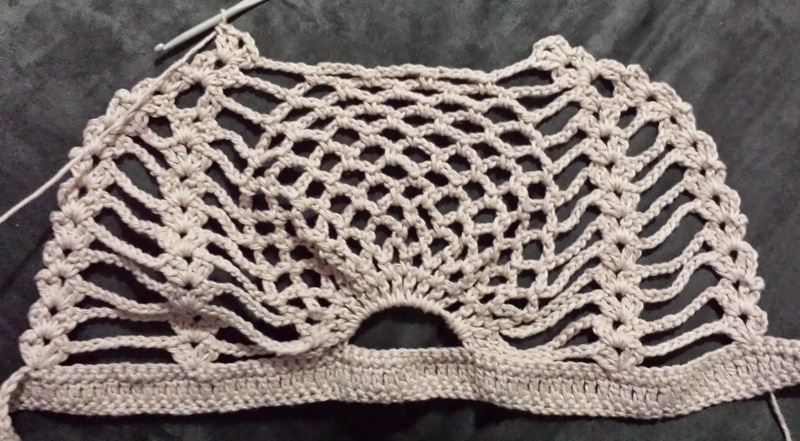 Either way, here's a fantastic crochet pillow pattern just for you! 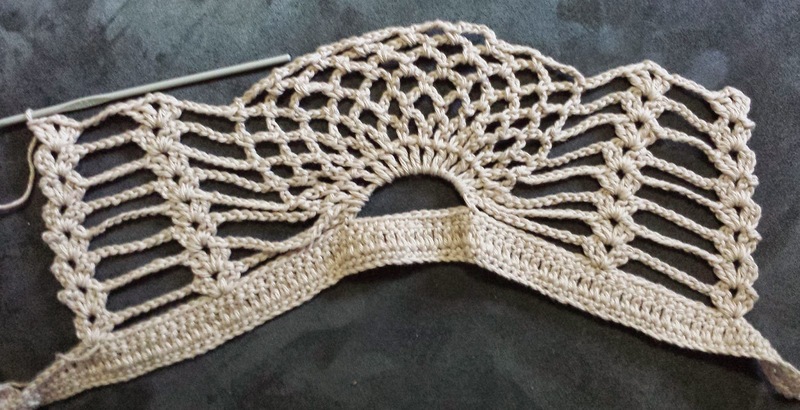 Fiber arts such as Crochet and Knitting are most often thought of as winter time activities, but there are tons of amazing summer style patterns out there. 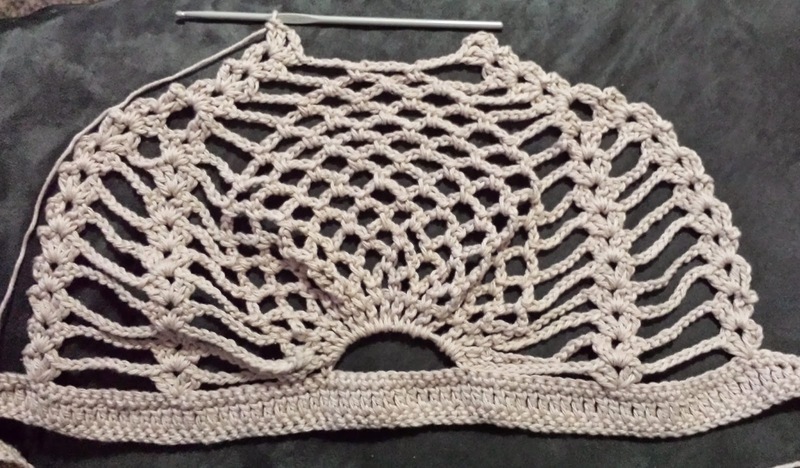 Most warm weather patterns use a light weight yarn, which requires a smaller hook; resulting in a lot more time to make the finished item. 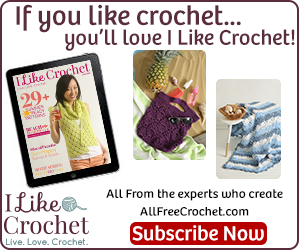 But don't worry because you CAN create some awesome crochet things AND save time! 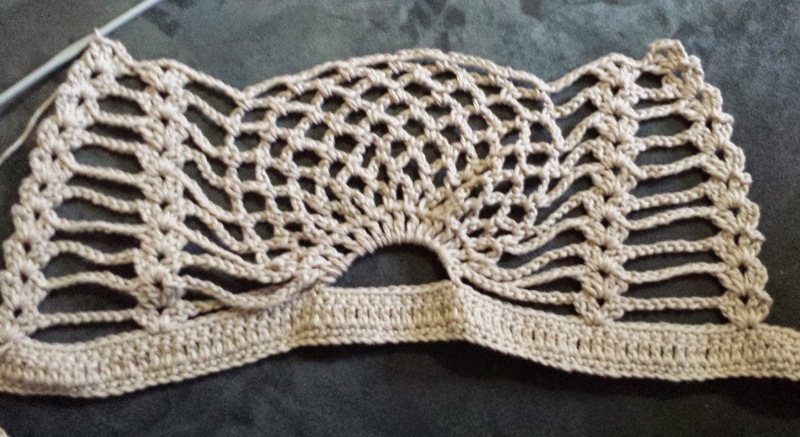 Crochet can look really exquisite as the highlight of a garment. 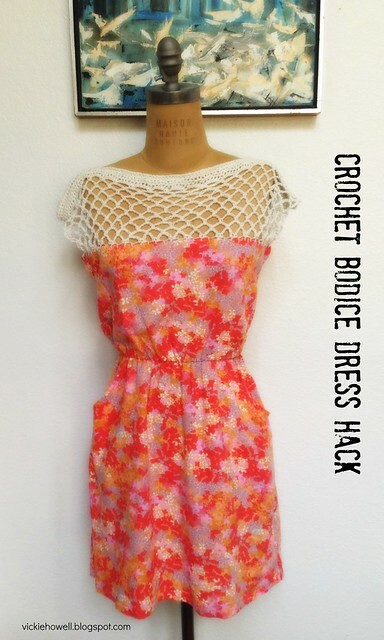 Think of a dress that uses crochet as the bodice and flows into a beautiful fabric drape! Do you have boring old T-shirts laying around? ... Or a large piece of fabric (maybe even from another garment) that you like, but have no idea what to do with it? 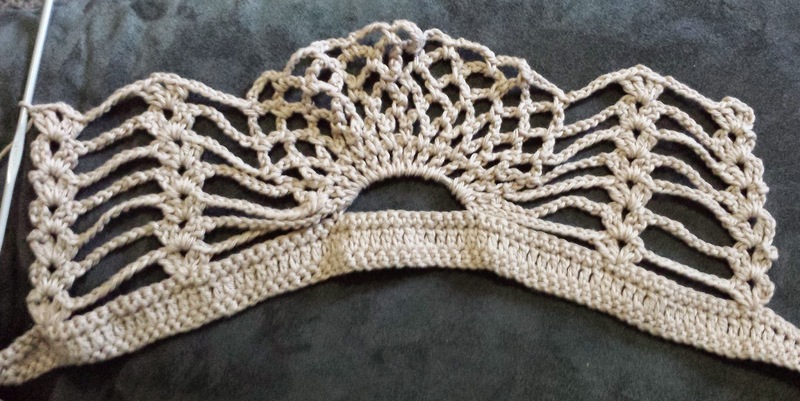 Crochet a collar, add sleeves, add a cool crochet edging! 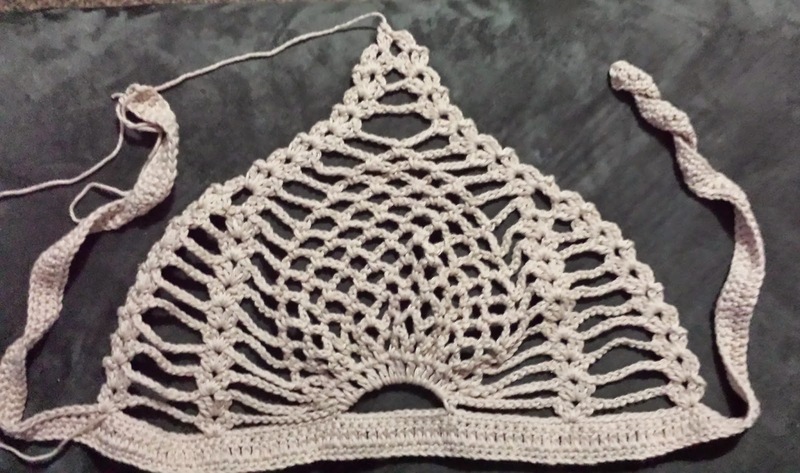 Crocheting and fabric is not only for garments, don't forget your accessories! 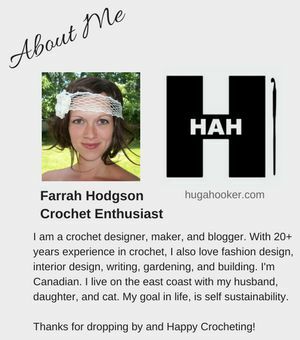 I've seen crochet added to pockets of jeans, shorts, and jackets. 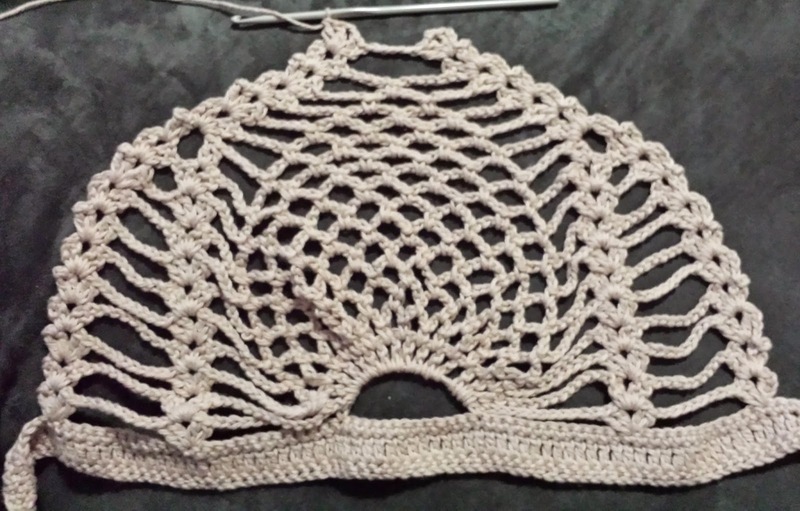 As borders or to add length to all kinds of skirts and tops. 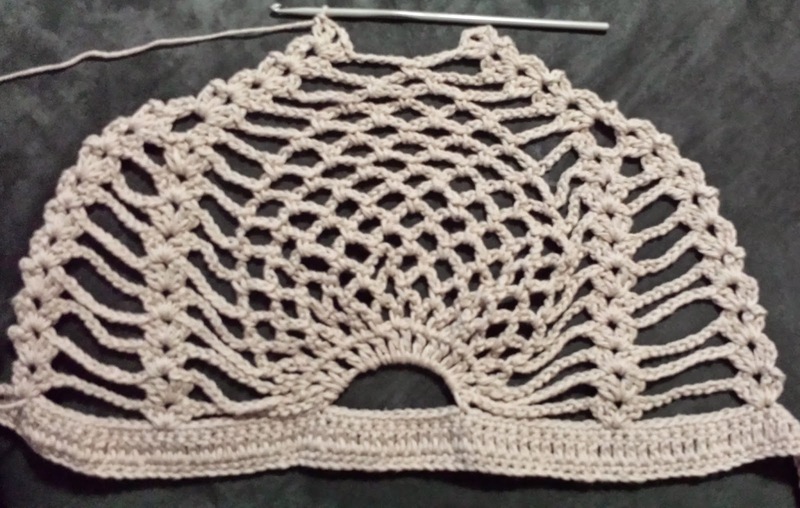 I've also seen crochet edgings used on home decor such as curtains, pillow cases, edges of blankets and quilts, tablecloths and pillows. This pretty wine glass lanyard has a heart touching story behind it. 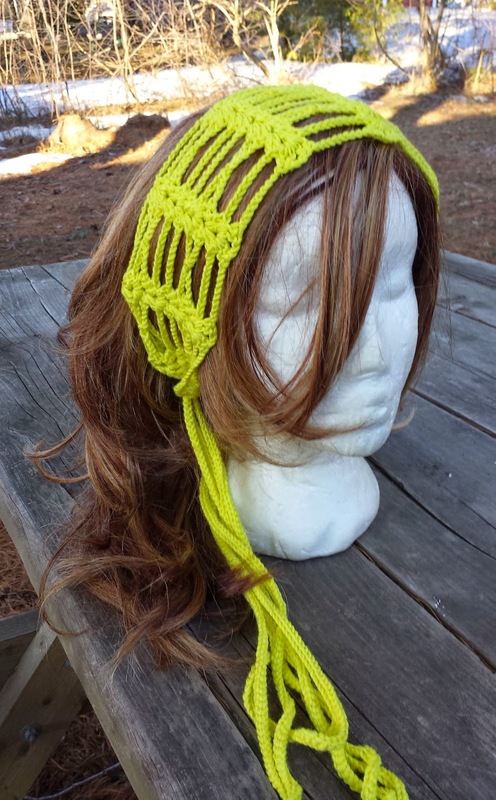 The designer offers this pattern for free, but you can make a donation to their cause if you'd like. 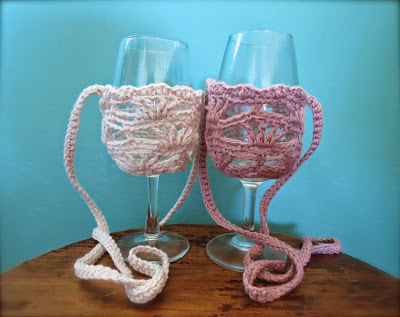 This makes a great gift for the wine drinkers in your life, or yourself! 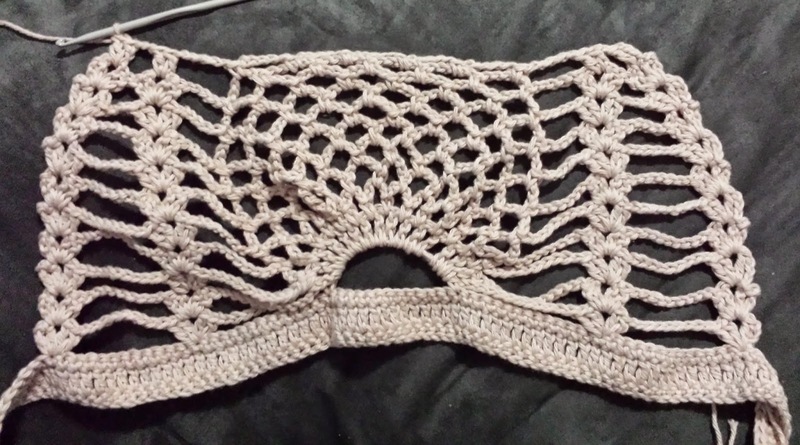 I smiled when I found this pattern, because I knew exactly where the inspiration came from without reading the title. I've been waiting for this! 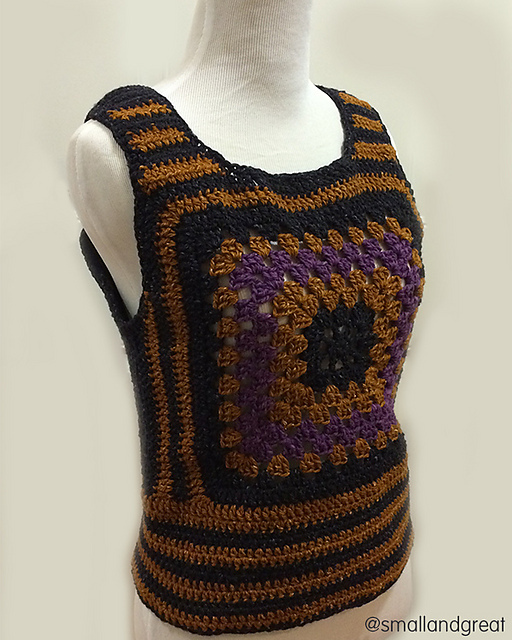 If you follow runway fashion, or have read my article, Crochet Inspiration on the Runway, Spring 2015; you will recognize this vest! Miu Miu (by Prada) featured this granny square vest in their Resort Collection, in several color combos. If you love it, you are in luck! 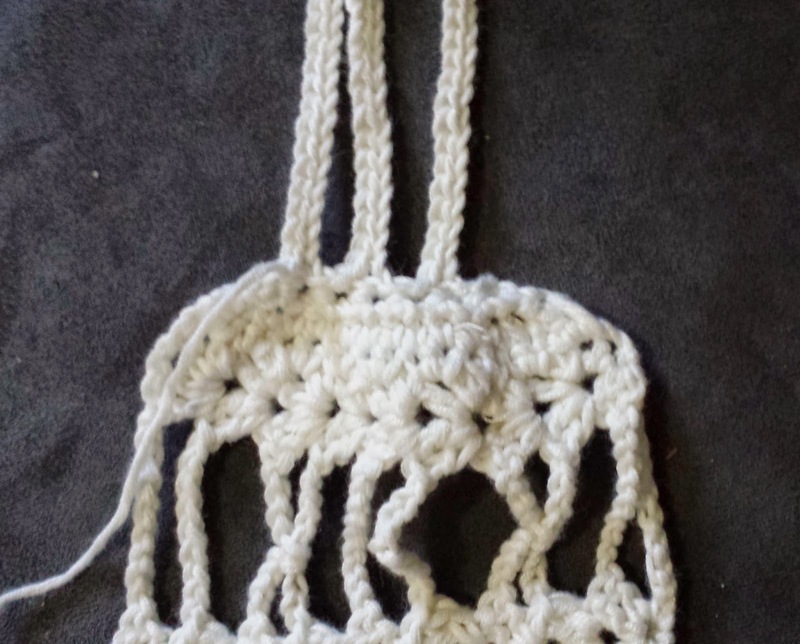 This is an easy item to make. Frogs for your baby's feet! How adorable! 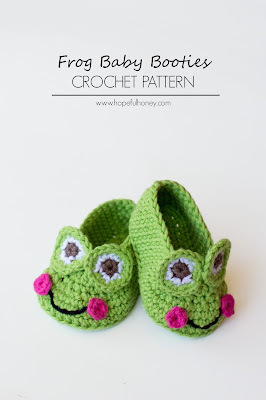 Here's another cute crochet baby booties from Hopeful Honey. These super cute booties are suitable for baby boys and girls and sure to bring smiles. Size: 0 - 6 months old. 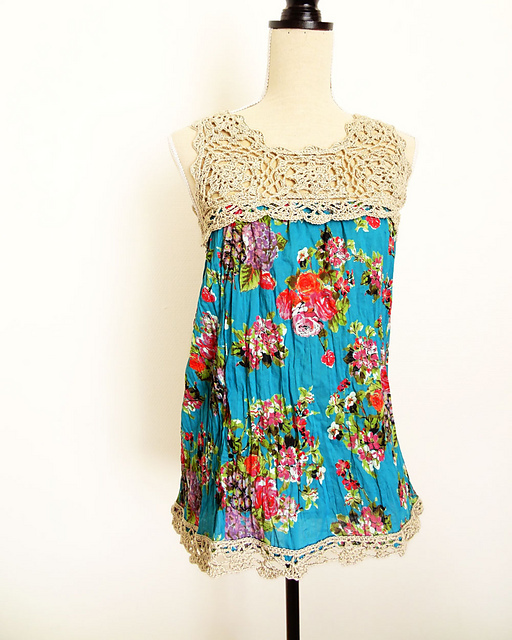 Changes for size 6- 12 months are in ( ). 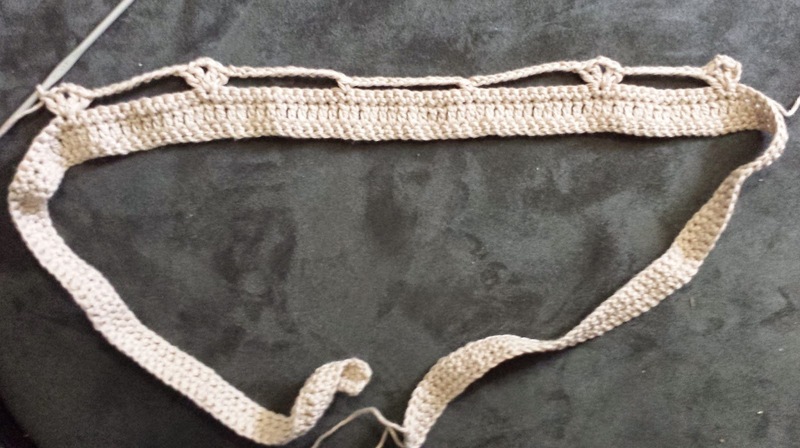 Crochet shorts are always a beautiful summer must have, but free shorts patterns are hard to come by. Thank you Drops Design for this pretty summer pattern. Ok, I need to make one of these right away! How cute is this? 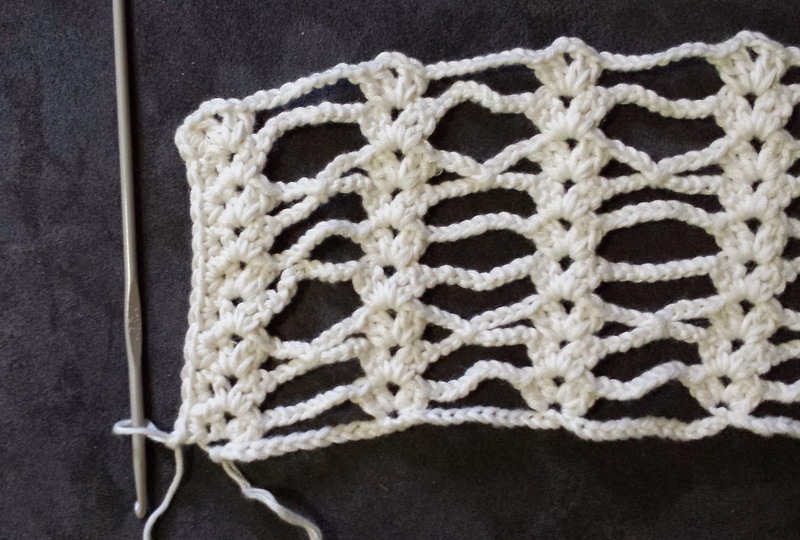 This pattern is so easy; make some granny squares, join them, and add some frills. 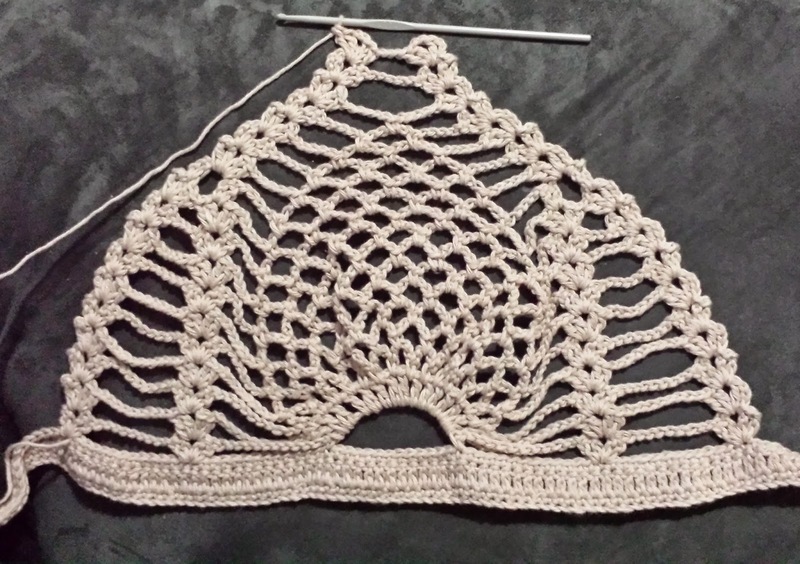 The pattern is for a 1-2 year old, but I think this would be easy to modify for any size. I can see this on a little girl as well as an adult! 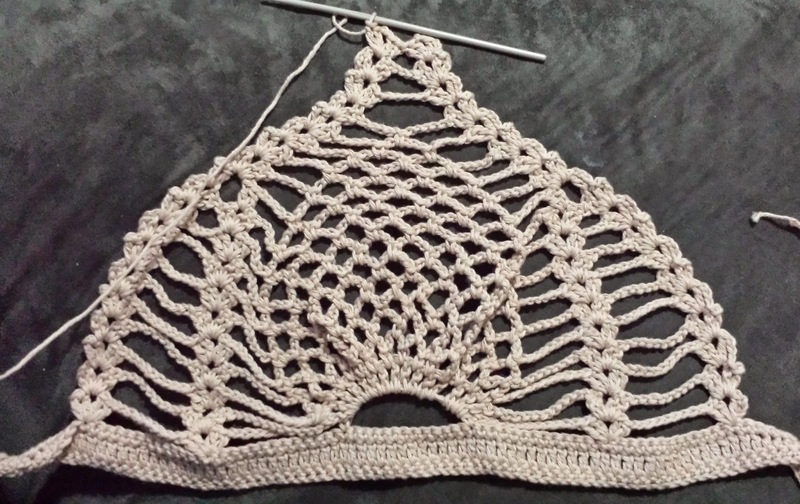 This pattern could also be a stash buster project. I find a lot of the time when I'm designing something with a special feature (such as the pineapple), that it inspires me to create another pattern using the same feature. 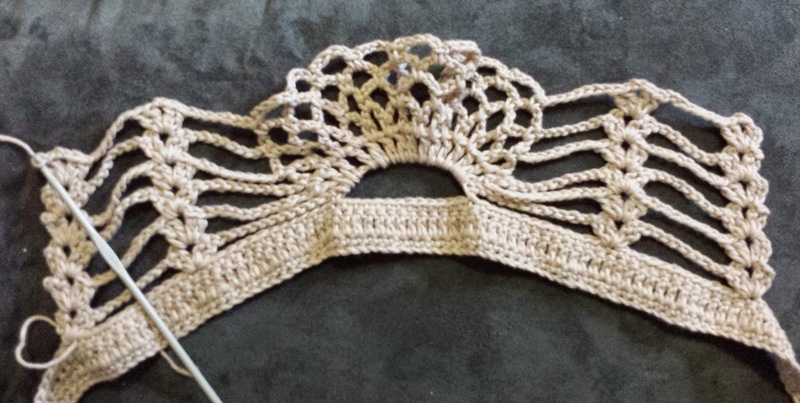 My recent Pineapple Up Barefoot Sandals pattern along with another hair kerchief pattern (that I have yet to write up) are the inspiration for this pattern. 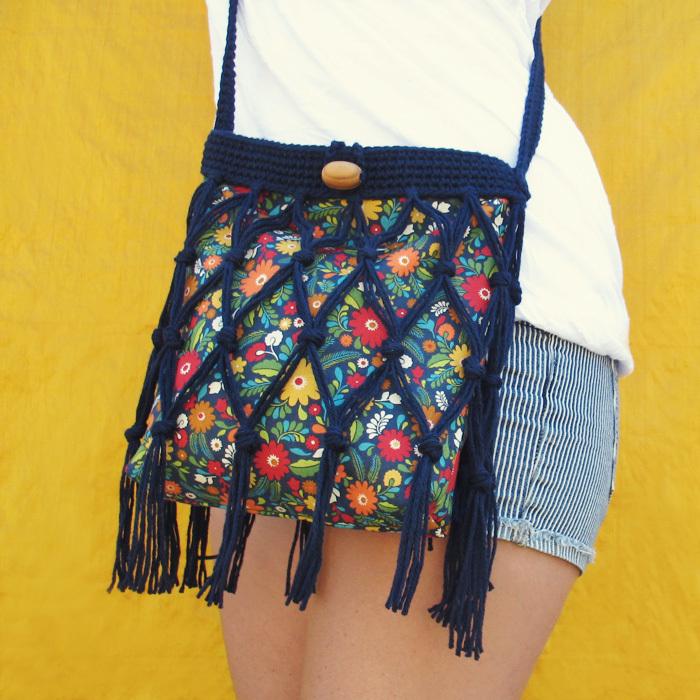 This is a great accessory for the summer, and it is a fun item to make! 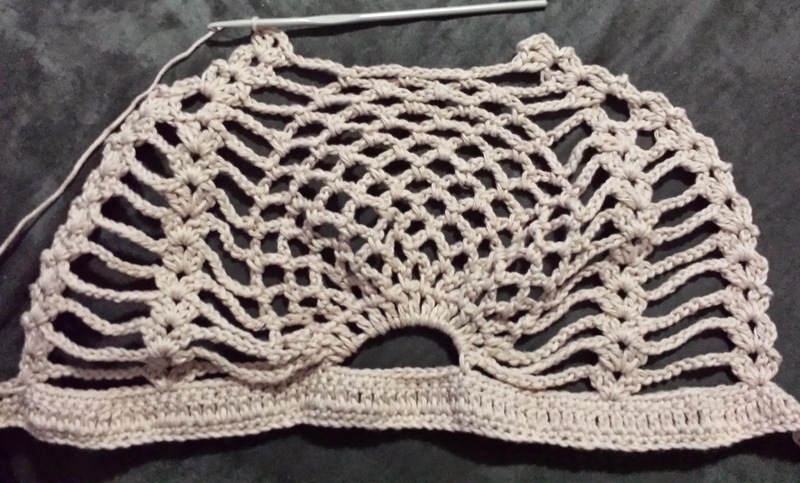 If you're new to the pineapple crochet, I've added a photo tutorial to help you out! Row 2: Ch1, turn; sc in next 55 sts, hdc in next 3 sts, dc in next 70 sts, hdc in next 3 sts, sc in next 55 sts. Row 4: Ch3 (counts as 1dc), (dc-ch2-2dc) in same st, ch 9-skip next 12 sts; shell in next st; (ch 12-skip next 12 sts, sc in next st) twice; ch12- skip next 12 sts, shell in next st; ch9- skip next 12 sts, shell in next st; leave remaining 60 sts unworked. Row 5: Turn; sl st over to ch 2 space; ch3, (dc-ch2-2dc) in same space; ch9- shell in next shell; ch12- skip over next 12 chs, *(dc-ch1) 14 times, dc** in center ch 12 space; ch12- shell in next shell; ch9, shell in last shell. Row 6: Turn; sl st over to ch 2 space; ch3, (dc-ch2-2dc) in same space; ch9- shell in next shell; ch10- sc in next ch1 space; (ch5, sc in next ch1 space) 13 times; ch10- shell in next shell; ch9- shell in last shell. Row 7: Turn; sl st over to ch 2 space; ch3, (dc-ch2-2dc) in same space; ch9- shell in next shell; ch9- sc in next ch5 space; (ch5- sc in next ch5 space) 12 times; (ch9- shell in next shell) twice. Row 8: Turn; sl st over to ch 2 space; ch3, (dc-ch2-2dc) in same space; ch8- shell in next shell; ch8- sc in next ch5 space; (ch5- sc in next ch5 space) 11 times; (ch8- shell in next shell) twice. Row 9: Turn; sl st over to ch 2 space; ch3, (dc-ch2-2dc) in same space; ch7- shell in next shell; ch7- sc in next ch5 space;(ch5- sc in next ch5 space) 10 times; (ch7- shell in next shell) twice. Row 10: Turn; sl st over to ch 2 space; ch3, (dc-ch2-2dc) in same space; ch6- shell in next shell; ch6- sc in next ch5 space;(ch5- sc in next ch5 space) 9 times; (ch6- shell in next shell) twice. Row 11: Turn; sl st over to ch 2 space; ch3, (dc-ch2-2dc) in same space; ch5- shell in next shell; ch5- sc in next ch5 space; (ch5- sc in next ch5 space) 8 times; (ch5- shell in next shell) twice. Row 12: Turn; sl st over to ch 2 space; ch3, (dc-ch2-2dc) in same space; ch3- shell in next shell; ch5- sc in next ch5 space; (ch5- sc in next ch5 space) 7 times; ch5- shell in next shell; ch3- shell in last shell. Row 13: Turn; sl st over to ch 2 space; ch3, (dc-ch2-2dc) in same space; shell in next shell; ch5- sc in next ch5 space; (ch5- sc in next ch5 space) 6 times; ch5- (shell in next shell) twice. Row 14: Turn; sl st over to ch 2 space; ch3, dc in same space; ch2, 2dc in next shell; ch5- sc in next ch 5 space; (ch5- sc in next ch5 space) 5 times; ch5- 2dc in next shell; ch2, 2dc in last shell. Row 15: Turn; sl st over to ch 2 space; ch3, (dc-ch2-2dc) in same space; ch5- sc in next ch 5 space, (ch5- sc in next ch5 space) 4 times; ch5- shell in last shell. Row 16: Turn; sl st over to ch 2 space; ch3, (dc-ch2-2dc) in same space; ch5- sc in next ch 5 space; (ch5- sc in next ch5 space) 3 times; ch5- shell in last shell. Row 17: Turn; sl st over to ch 2 space; ch3, (dc-ch2-2dc) in same space; ch5- sc in next ch 5 space; (ch5- sc in next ch5 space) twice; ch5- shell in last shell. Row 18: Turn; sl st over to ch 2 space; ch3, (dc-ch2-2dc) in same space; ch5- sc in next ch 5 space; (ch5- sc in next ch5 space); ch5- shell in last shell. Row 19: Turn; sl st over to ch 2 space; ch3, (dc-ch2-2dc) in same space; ch5- sc in center ch 5 space; ch5- shell in last shell. Row 20: Turn; sl st over to ch 2 space; ch3, (dc-ch2-2dc) in same space; ch5- shell in last shell. Row 21: Turn; sl st over to ch 2 space; ch3, (dc-ch2-2dc) in same space; ch3- shell in last shell. Row 22: Turn; sl st over to ch 2 space; ch3, (dc-ch2-2dc) in same space; shell in last shell. Row 23: Turn; sl st over to ch 2 space; ch3, dc in same space; 2dc in last shell.